I welcome our kind viewers from Paso Robles, California to Stavanger, Norway, from Rochester in the state of New York to Moscow. Whether it wants to or not, Hungary must prepare to take back Subcarpathian Ukraine, at least its majority Hungarian-inhabited parts located alongside the Trianon border. In the event that Ukraine falls apart, we cannot pretend that we have nothing to do with the Verecke Pass, Munkács (Munkacheve) or the Carpathians. The new political powers in Ukraine are limiting use of the Polish, Russian and Hungarian languages once again. And it doesn’t really console us that the European Union also supports the genocidal, Hungarian-killing Beneš decrees. The Russian, Polish and Hungarian inhabitants of Ukraine cannot satisfy themselves with the fact that the European Union is supporting the Nazis and financing the fascists. It is the deeply held desire of Brussels that the new Ukraine be nationalist against the Russians, the Poles and the Hungarians, though internationalist toward the repositories of surreptitious global financial power—the EU, NATO and the IMF. And all of this from our money, because Hungary is also an accomplice to the EU, NATO and the IMF. Revision of the territorial changes stemming from the 1920 Treaty of Trianon, according to which Hungary lost two-thirds of its Austro-Hungarian Monarchy-era territory to the newly created or expanded states of Czechoslovakia, Romania, Yugoslavia and Austria, has been one of the greatest political taboos throughout the region of east-central Europe since the end of the Second World War. The only voices that have openly advocated the reincorporation into Hungary of Hungarian-inhabited territory in surrounding countries have been those of the radical-nationalist Hungarian fringe arising from extra-parliamentary political organizations such as the 64 Counties Youth Movement (Hatvannégy Vármegye Ifjúsági Mozgalom) and extremist websites such as Kuruc.info. 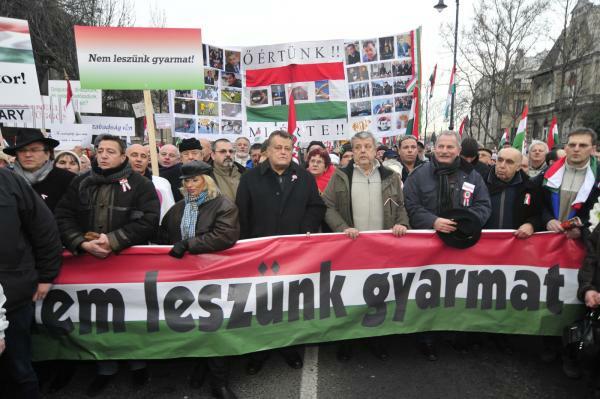 Echo TV owner Gábor Széles (center) at the head of a pro-government Peace March processions in Budapest. Ferenc Szaniszló, though notorious for his outlandish conspiracy theories and racist innuendo, is nevertheless much closer to the Hungarian political mainstream than others who have made similarly explicit irredentist statements. Echo TV, though only the 40th most-watched television station in Hungary, is the most popular pro-government news station ahead of the more moderate Hír TV [News TV] (source in Hungarian). The owner of the Echo TV channel that broadcasts Szaniszló’s twice weekly program is staunchly pro-Orbán media tycoon Gábor Széles, who has been one of the main organizers of the massive pro-government Peace March processions that have taken place in Budapest about every six months since 2012. 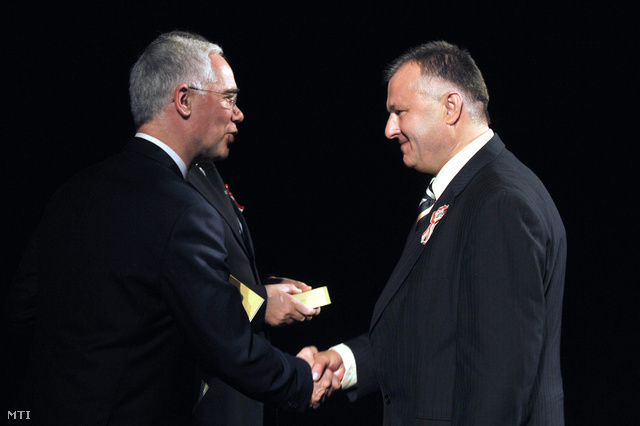 Minister of Human Resources Zoltán Balog (left) presenting journalist Ferenc Szaniszló with a Mihály Táncsics Prize on March 14, 2013. On March 14, 2013, Orbán government Minister of Human Resources Zoltán Balog presented Szaniszló with a state-sponsored Mihály Táncsics Prize in recognition of outstanding achievement in the field of journalism. However, after several days of sharp protest from the socialist and liberal opposition and the US and Israeli ambassadors to Hungary, Balog requested on March 19 that Szaniszló return the prize, claiming that he had been unaware of the highly publicized incendiary statements the journalist had made during his program over previous years, including an anti-Gypsy diatribe in February 2011 for which the National Media and Infocommunications Authority fined Echo TV 500,000 forints (1,800 euros) for violating regulations prohibiting incitement to hatred (source in Hungarian). Szaniszló complied with the minister’s request, asserting during his following television program “Israel has triumphed over Ferenc Szaniszló” (source in Hungarian). Although Prime Minister Viktor Orbán and the members of his administration have been very careful to avoid making statements that can be construed as irredentist and have never given any indication that they, themselves, maintain anti-Gypsy or -Semitic attitudes, Ferenc Szaniszló’s open reference to the possibility of territorial revision on February 28 and previous racist commentary during his television program on the pro-government television station Echo TV provide evidence of the direct connections that exist between the Orbán government and the exponents of radical Hungarian nationalism. Passions have not calmed in Kiev. Snipers are shooting members of law-enforcement services from the roof of a hotel. The Ukrainian interior ministry is recommending that people do not go out onto the streets, because there are armed individuals there. Law-enforcement organizations have begun the process of locating and neutralizing the terrorists. According to the former deputy president of the Ukrainian secret service, anti-terrorism investigation applies to all Ukrainian citizens and only serves to further aggravate the situation that has developed in the country. According to the former representative, the anti-terrorism operation is essentially tantamount to the introduction of martial law. In Kiev the Metro is still not running—its entries have been blocked with big metal bars. Banks, shops and cafés are closed. Meanwhile Kiev Mayor Volodymyr Makienko announced that he is withdrawing from the governing party in protest against the bloodbath and fratricidal war taking place in the Ukrainian capital. Representatives from the governing party and the opposition as well as demonstration leaders have initiated the urgent convocation of parliament in order to resolve the grave domestic crisis. Representatives from the governing party have summoned opponents to discontinue violence and begin peace talks with German, Polish, Russian and American mediation. 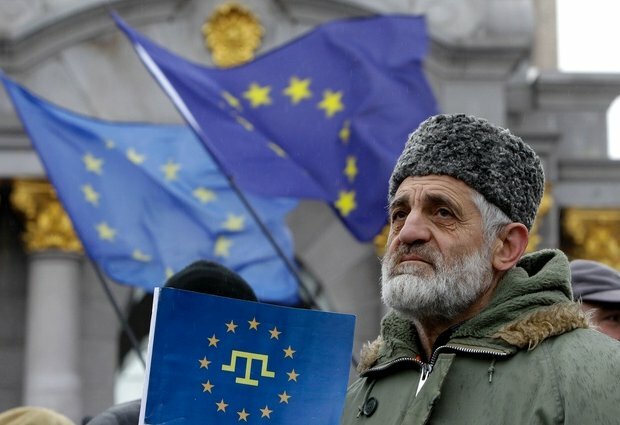 Pro-European Union demonstrator in Kiev. Kossuth Radio aired this report as media throughout the rest of Europe focused the Ukrainian police’s use of live ammunition in an attempt to quell the increasingly violent anti-government demonstrations in Kiev, killing and wounding a large number of unarmed protestors in the process. The Kossuth Radio report does not cite the number of civilian casualties, at this time estimated to be around 60 dead and several hundred wounded over the previous 36 hours, referring to the Euromaidan demonstrators in a sentence without an identified source as “terrorists” whom law-enforcement authorities were “locating and neutralizing.” Nor does it mention any of the demands of demonstration leaders, notably the resignation of subsequently ousted president Viktor Yanukovych. The public media is reporting continually on the Ukrainian crisis. We use as sources for news both the opinions of the opposition and statements from the governing party as well as accounts from our reporters on location and from major world news-agencies. The report broadcast on Kossuth Radio’s 2:00 p.m. news on Thursday was likewise based on several various sources, including information from the Russia Today television station and the internet edition of a Russian daily newspaper. We are continually stating other opinions as well in the course of the radio’s news programs. News editors cannot express criticism of the reports arriving from various sources. Kossuth Radio has been subjected to several attacks as a result of the news it aired on a single occasion on Thursday. We draw the attention of those who have voiced criticism to the fact that they have seized upon a single report within an entire day’s programming, which included the broadcast of news reflecting numerous other points of view, though they do not mention these. 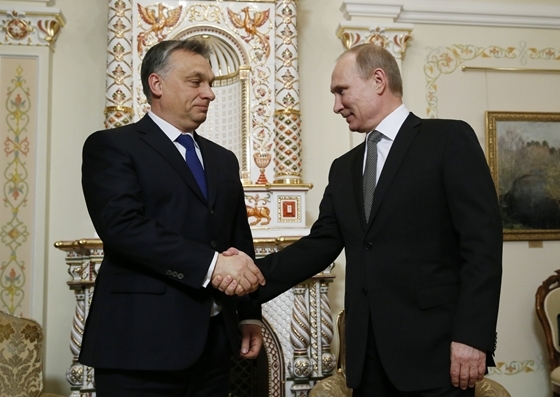 Orbán and Putin meet in Moscow in January 2014. The Kossuth Radio statement reveals that the station based its 2:00 p.m. news report on the anti-government demonstrations in Ukraine on Russian sources, including the overtly anti-Euromaidan news station RT (formerly known as Russia Today), though the original report did not cite these sources. The statement contends that Kossuth Radio presented news of the demonstrations from other perspectives in the course of other broadcasts during the day. This contention, even if true, does not negate the fact that Kossuth Radio’s report on the protests during their deadly culmination on the afternoon of February 20 was much closer to that of pro-Yanukovych sources from Russia than it was to pro-opposition European sources such as those from the United Kingdom and France. There are two reason that government-controlled Kossuth Radio broadcast this report essentially reflecting the official Russian stance toward the anti-government demonstrations in Kiev: first, the Orbán government wants to remain in favor with the Putin administration now that Hungary has signed an interstate agreement with Russia for a 10-billion-euro loan to build two new reactors at the Paks Nuclear Power Plant (see Deal of the Century); and second, there exists an obvious and forboding parallel between the pro-Russian Yanukovych government and pro-European Union demonstrators in Ukraine and the eastward-oriented Orbán government and the westward-oriented democratic opposition in Hungary.